The Santa Clause 3: The Escape Clause is a 2006 American Christmas fantasy comedy adventure film directed by Michael Lembeck. It is the third and final film in the Santa Clause film series following The Santa Clause and The Santa Clause 2. Its production was completed in February 2006. The movie was released in theaters on November 3, 2006 in the US followed by a release date of November 24 for the UK. The DVD and Blu-ray were released on November 20, 2007 in the U.S. and November 12, 2007 for the UK. Twelve years have passed since Scott Calvin took on the mantle of Santa Claus, redeemed himself to be good, solved The Santa Clause Mysteries and married Carol Newman, who has now become a teacher in the North Pole. On Christmas Eve, she tells a group of young elves a story from her life with Scott while expecting their first child. Scott invites his in-laws, Sylvia and Bud Newman, to the North Pole, along with Scott's former wife, Laura, her husband, Neil, their daughter, Lucy, and Scott's son, Charlie. Meanwhile, he is summoned to a meeting of the Council of Legendary Figures, consisting of Mother Nature, Father Time, the Easter Bunny, Cupid, the Tooth Fairy, and the Sandman, concerning the behavior of Jack Frost, who is jealous that he has no holiday or special occasion in his honor. Because he has been promoting himself during the Christmas season, Mother Nature suggests sanctions against him. When Scott says he is dealing with how to get the in-laws to come without revealing that he is Santa, Jack Frost negotiates a light sentence of community service at the North Pole, helping Scott and the elves put up various Canadian-themed paraphernalia, as Carol's parents believe Scott is a toy-maker in Canada, which Scott agrees. However, Frost's ultimate goal is to trick Santa into renouncing his position. When elf Curtis inadvertently reveals the "Escape Clause," Frost sneaks into Santa's hall of snow globes and steals one containing Scott as Santa. If Scott holds the globe and says, "I wish I'd never been Santa at all," he will go back in time and undo his career as Santa. When Lucy discovers this, Frost freezes her parents and locks her in a closet. He then orchestrates situations that make Scott think he must resign to make things better. 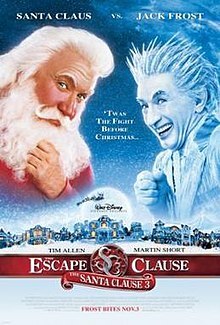 Frost tricks Scott into invoking the Escape Clause and both are sent to Scott's front yard in 1994, when Scott caused the original Santa to fall off of his roof and had to replace him. Frost causes the original Santa to fall off the roof and grabs Santa's coat before Scott can, making Frost the new Santa. Scott is sent back to the present day, where he has been CEO of his old company for the last 12 years and business takes priority over family. Scott also learns that Laura and Neil divorced and Carol moved away years ago. Scott goes to find Lucy and Neil, who are vacationing at the North Pole, which Frost has turned into a tourist resort. Christmas is now "Frostmas", the elves are miserable, and the reindeer are confined to a petting zoo. When Scott finds Lucy and Neil, Neil states that Charlie didn't want him to be his father, causing the divorce between him and Laura. Scott confronts Frost and tricks him into recording his voice stating the Escape Clause. Scott has Lucy steal Frost's snow globe and bring it to him; when Frost finds out and takes the globe back, Scott plays the recording of Frost saying, "I wish I'd never been Santa at all", invoking the Escape Clause and causing Scott and Frost to be sent back again to 1994. Scott restrains Jack long enough to let his 1994 counterpart get the coat, making him Santa Claus again as well as taking him back to the North Pole in the present, where no time has passed. Scott reconciles with his family and Jack is arrested by elf police. He reveals he cannot unfreeze his victims unless he unfreezes himself. Scott convinces Lucy via a snow globe he had given her earlier of her warmly hugging a snowman, to give Frost a "magic hug" to unfreeze and reform him. It works, Laura and Neil unfreeze and Frost becomes a new person. The "Canada" ruse is dropped and Scott appears as Santa to Carol's parents. With two hours remaining before Santa must leave for his Christmas deliveries, Carol goes into labor. Back to the present time, while Carol is telling the tale to her students, Scott walks in to reveal their baby boy, Buddy Claus. On Rotten Tomatoes, the film holds an approval rating of 17% based on 65 reviews, with an average rating of 3.7/10. The site's critical consensus reads, "Playing Jack Frost as an evil cross between Liza Minnelli and Liberace, Martin Short is a welcome presence, but this tired series continues drawing from its bag of bland gags and dumb slapstick." On Metacritic, the film has a weighted average score of 32 out of 100, based on 17 critics, indicating "generally unfavorable reviews". Audiences polled by CinemaScore gave the film an average grade of "B+" on an A+ to F scale. Erid D. Snider wrote that Allen did The Santa Clause "The first time with enthusiasm, the second time with affection and the third time for a paycheck". Kyle Smith wrote, "We're getting a turkey and a ham for the holidays. Santa is so dumb he should be demoted to cleaning up after Geoffrey the Giraffe at Toys 'R' Us." Manohla Dargis dismissed the film as "Squeaky clean, but you might die of boredom." Finally, Mark Kermode described it on BBC Radio Five Live as "the cinematic equivalent of tertiary syphilis". The first two films had become box-office successes during their opening weekends, but The Santa Clause 3 was beaten by Borat for the No. 1 spot. The Santa Clause 3 made $84,500,122 in North America and a worldwide gross of $110,768,122. The first film made $189,833,357 worldwide at the box-office while the second film made $172,855,065. The film was released on both standard DVD and high-definition Blu-ray Disc on November 20, 2007. A tie-in video game was released on November 1, 2006 for the Game Boy Advance, developed by 1st Playable Productions and published by Buena Vista Games. ^ Puchko, Kristy. "19 Fun Facts About Tim Allen's 'The Santa Clause'". Phactual. Retrieved September 13, 2016. ^ "The Santa Clause 3: The Escape Clause (2006)". Box Office Mojo. Retrieved September 13, 2016. ^ "The Santa Clause 3: The Escape Clause Reviews". Metacritic. Retrieved 2016-08-23. ^ "The Santa Clause 3: The Escape Clause – CinemaScore". CinemaScore. Retrieved December 15, 2017. ^ "Lee's Movie Info". leesmovieinfo.net. Retrieved 6 October 2014. ^ "The Santa Clause 3: The Escape Clause". IGN. Retrieved 2016-12-26. This page was last edited on 28 February 2019, at 05:14 (UTC).